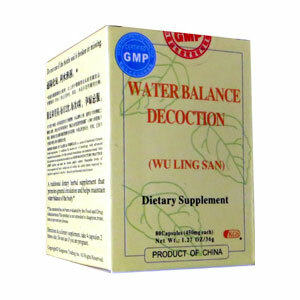 A traditional herbal supplement that promotes general circulation and helps maintain water balance of the body. Accumulation of cold water in the Lower Jiao, possibly with external Wind Cold with Difficult urination, fever, irritability, strong thirst with vomiting after drinking, and headache. Spleen Qi deficiency causing internal accumulation of water and dampness with general muscle and skin edema with a sensation of heaviness, difficult urination, diarrhea, and vomiting. Accumulation of fluids in the Lower Jiao with a pulsing or throbbing sensation below the umbilicus, frothy saliva, dizziness, vertigo, shortness of breath, and coughing. Take 4 capsules, 2 times a day. Do no use during pregnancy. This formula is warming and drying and should be used with caution in cases of difficult urination presenting with Yin and fluids deficiency. Do not use long term with Kidney Qi or Spleen Qi deficiency. Possible side effects may include: Loss of appetite, dizziness, vertigo, and a bland taste in the mouth.